Webcam Barrow, Alaska: Barrow Sea Ice Webcam - A view of the arctic ocean at the northernmost city of the USA. Barrow (Utqiagvik), Alaska: Barrow (Utqiagvik) Airfield (PABR), View in NorthEastern Direction, 0.2 mi. Barrow (Utqiagvik), Alaska: Barrow (Utqiagvik) Airfield (PABR), View in Eastern Direction, 0.2 mi. Barrow (Utqiagvik), Alaska: Barrow (Utqiagvik) Airfield (PABR), View in Southern Direction, 0.2 mi. Barrow (Utqiagvik), Alaska: Barrow (Utqiagvik) Airfield (PABR), View in SouthWestern Direction, 0.2 mi. Atqasuk, Alaska: Atqasuk Airfield (PATQ), View in Northern Direction, 58.5 mi. Atqasuk, Alaska: Atqasuk Airfield (PATQ), View in Eastern Direction, 58.5 mi. Atqasuk, Alaska: Atqasuk Airfield (PATQ), View in Southern Direction, 58.5 mi. Atqasuk, Alaska: Atqasuk Airfield (PATQ), View in SouthWestern Direction, 58.5 mi. 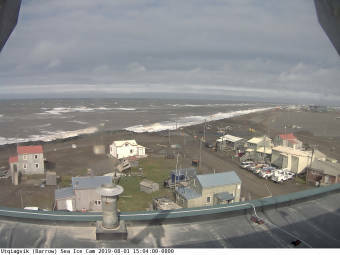 This webcam Barrow, Alaska with the theme Seaview was added on November 11, 2010 and is operated by Sea Ice Group at the Geophysical Institute. It got 28989 visitors since then. Shouldn't this webcam work or should the link be wrong please report that here. You can add this webcam here to myCams.